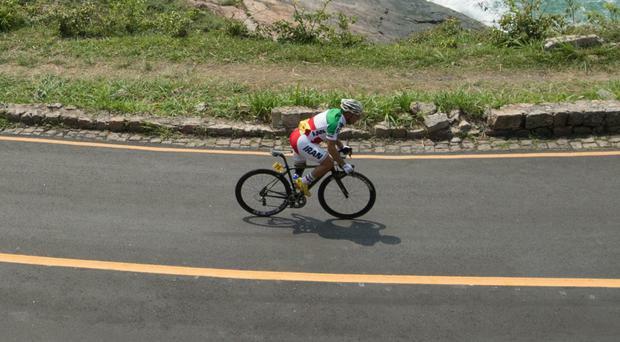 Iranian cyclist Bahman Golbarnezhad died following a crash at the Rio Paralympics on Saturday. Banged up in Bangu prison last Friday, perhaps Pat Hickey will have time to reflect on those other poor unfortunates who also ended up behind bars despite protesting their innocence. Paul Kimmage: How did Pat Hickey become the most hated man in Irish sport? Television sports presenter Charlie Webster is "fighting for survival" in a Rio hospital after she contracted a rare strain of malaria. Irish Olympic chief Pat Hickey, his wife Sylviane and Russian president smile for a snapshot in Moscow. The consequences of that track fall in the 10,000m final on Saturday night are still there for Mo Farah. The good news is that Usain Bolt will bow out in London at next year's World Athletics Championships: an emotional treat for British spectators. Rio 2016 was hit by the biggest scandal of the Games last night - after a Kenyan official was sent home for posing as an athlete and giving a urine sample. World Rowing has taken the hardest stance with Russia since athletics ahead of the Rio Olympics, banning 22 of the nation's 28 rowers from competing. Up to 90 per cent of Russia's team for the Olympics could still be banned from next month's Games, despite the International Olympic Committee's refusal to expel the entire country from the event. Yuliya Stepanova, the whistleblower who lifted the lid on Russia's shocking state-sponsored doping regime, has been told she is not eligible to compete at the Olympics. It can feel churlish to worry about refereeing decisions or a misplaced pass or missed tackle in the aftermath of a coup or a terror attack or the markets wiping people's pensions out. Yet we do. The Rio Olympics have been hit by allegations of a conflict of interest over the dangers of the Zika virus to thousands of athletes and fans travelling to Brazil. This summer's Rio de Janeiro Olympics should be moved or postponed because of the ongoing Zika virus, according to more than 150 global health experts.